This is the sixth in a series of visualizations on legal employment outcomes for the Class of 2017. 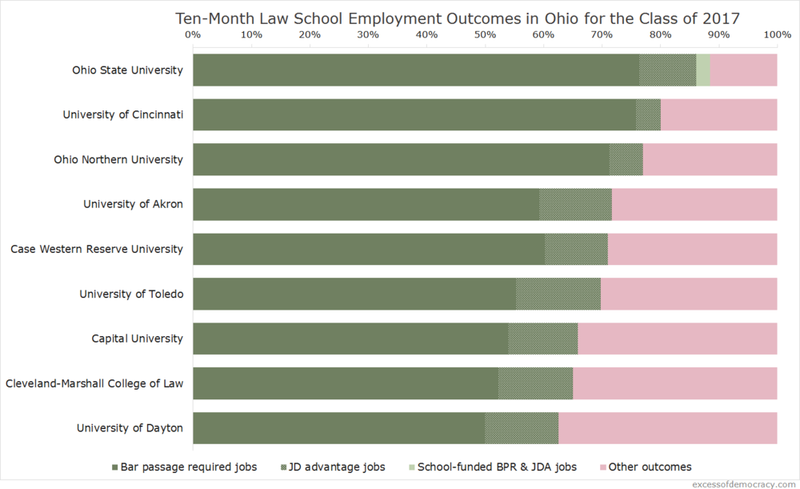 Following posts on outcomes in Florida, Pennsylvania, Texas, New York, and Illinois, here is a visualization for legal employment outcomes of graduates of Ohio law schools for the Class of 2017. (More about the methodology is available at the Florida post.) Last year's Ohio post is here. There were around 950 graduates of Ohio's 9 law schools, down from around 1090 two years ago. That's helped placement in bar passage required and J.D. advantage jobs rise to 72.8% (including a few school-funded jobs), up three points. Overall jobs increased slightly. Remarkably, four of these law schools graduated classes of fewer than 100 students. As always, please notify me of any corrections or errata.